No doubt that your car is one of your valuable investments, and with the help of car tinting services you can easily protect your valuable asset and increases its reliability. Windows tinting blocks the entrance of unwanted sun rays in the car that causes damage to the leather and vinyl. It saves leather seats from discoloration and protects the interior structure of the car. Moreover, it also protects eyes from the exposure of direct sunlight and bright headlights. It has been observed that car tinting services successfully blocked 99% of harmful Ultraviolet rays coming from the sun. These Ultraviolet rays can cause skin cancer and speed up skin aging process. Several case studies revealed a fact that almost 57% of skin diseases can occur from the left side of the body which shows a parallel relationship to the side of the car driver. With the help of windows tinted service, drivers can easily be a safeguard from the above-mentioned risks and start a healthy life. The benefits of tinting service cannot be challenged. It effectively protects the glass from shattering if anything hard hits to it. 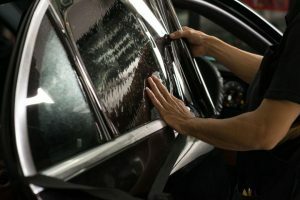 Moreover, it has been observed from several accidents that cars with tinted windows protected the passengers from broken glass pieces as compared to the car with normal windows. A wide variety of window tinting is available in the market nowadays to facilitate customers to achieve a level of privacy for all the passengers in the car. It protects your car from the eyes of robbers and successfully protects your valuables, placed in the car. With your windows tinted you can easily park your car anywhere you want. Windows tint comes in a variety of colors from lighter shade like light blue, silver to darker shade like black, navy blue etc. Some people prefer to choose tint color with their car color while some prefer to select contrast shades to make it more attractive. Moreover, people having security concerns prefer to select black tint color so that no one can outside look into the car. Except all of these merits, windows tinting service has some disadvantages also concerning legal issues. Law only allows private cars to be tinted and passenger service vehicles are not allowed to be tint so that no illegal act can be done.